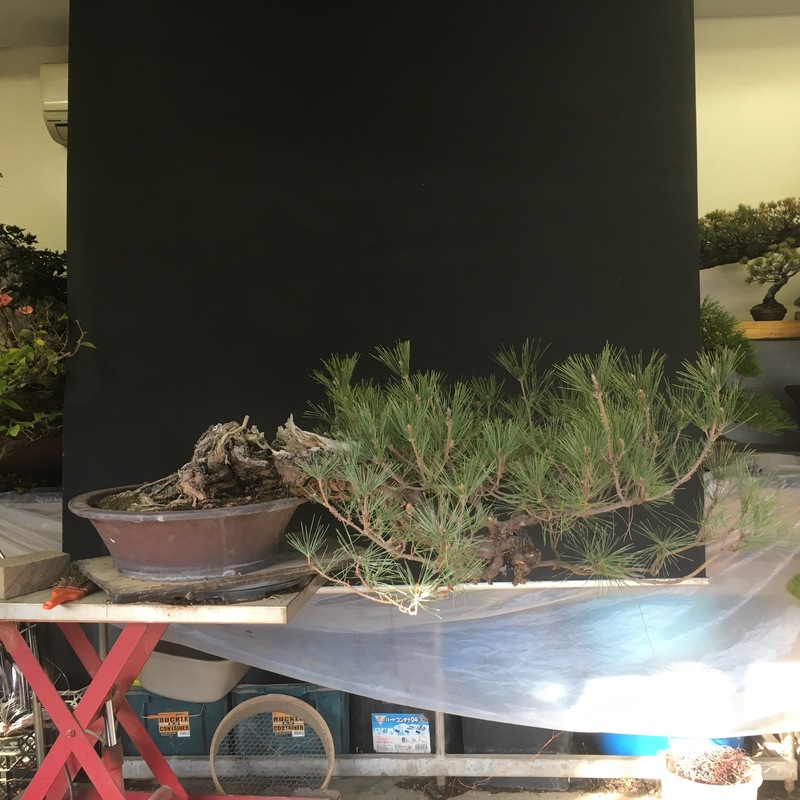 This white pine has been living on the roof of Aichi-en since I have been here and is a piece I’ve always admired. It has good leaf, old bark and interesting movement. It is a tree that Mr Tanaka bent the trunk a long time ago, it was a hard bend for such a thick trunk (about 6cm). 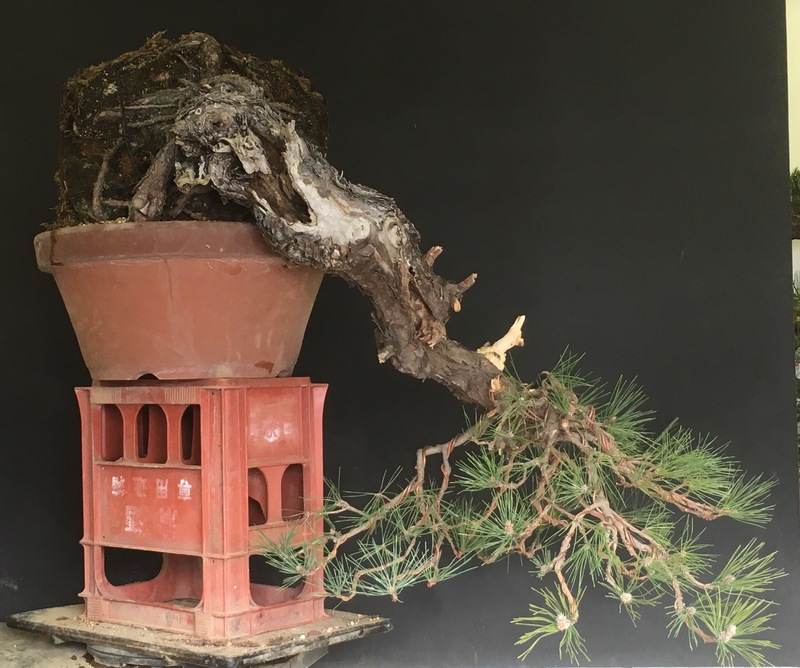 For some unknown reason the second trunk on died a year or so ago, strange as this trunk wasn’t bent hard (This is the crazy Jin near the base). It was unfortunate because as a twin trunk it was a little more unusual and unique. However these thing’s happen and we have to make the most of the material that it is now. It was re-potted into this terra cotta growing pot, has since gained strength and is now ready for a styling. The old needles had already been pulled so I set about wiring the tree, bring branches down and making pads. 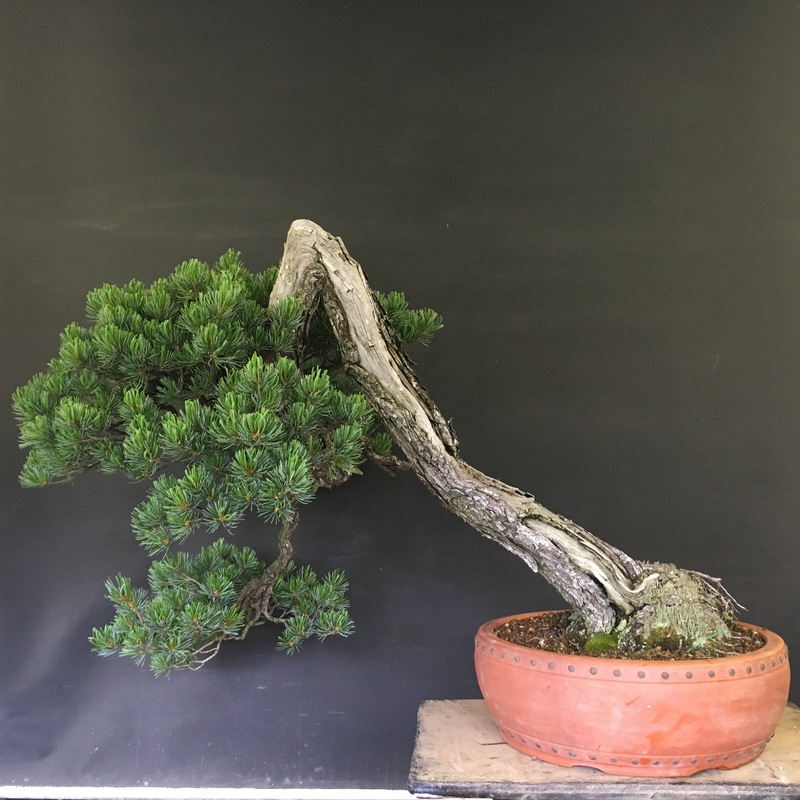 ﻿It’s wasn’t the easiest of tree’s being quite leggy and it has a long way to go to fill out but, hopefully in a little time it will be on its way to being a bonsai. Not every body knows but, Aichi-en has two plots of the nursery a couple of blocks apart. The second area which is least know, we refer as the field. It contains very low concrete benches and a little growing bed area. 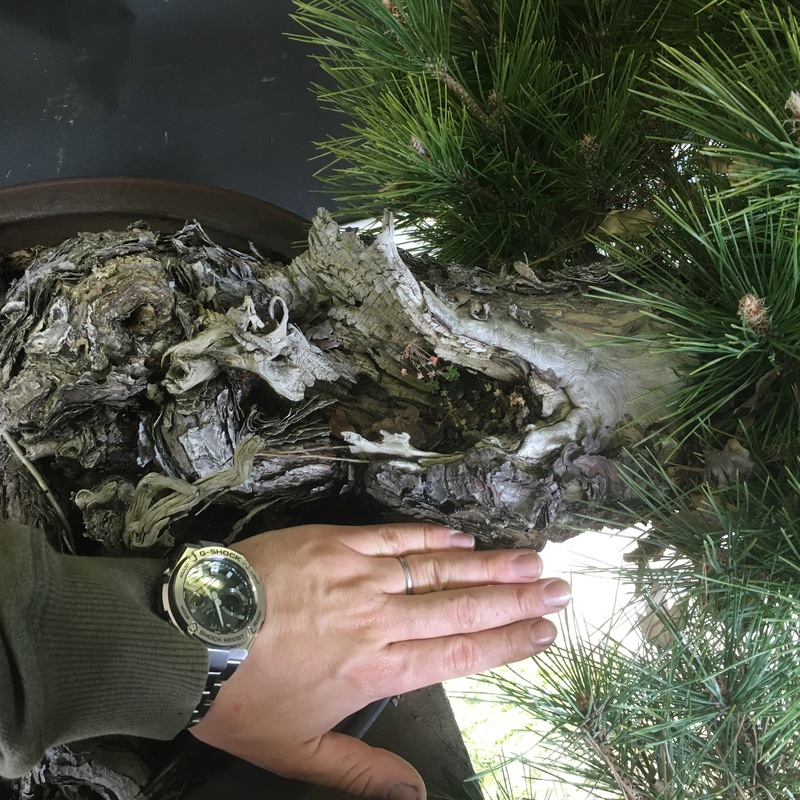 Most of the tree’s there are very raw, in development or just too big too fit on the nursery. They are watered and mainly taken care of by Mr Tanaka’s mother and acts as an overflow. 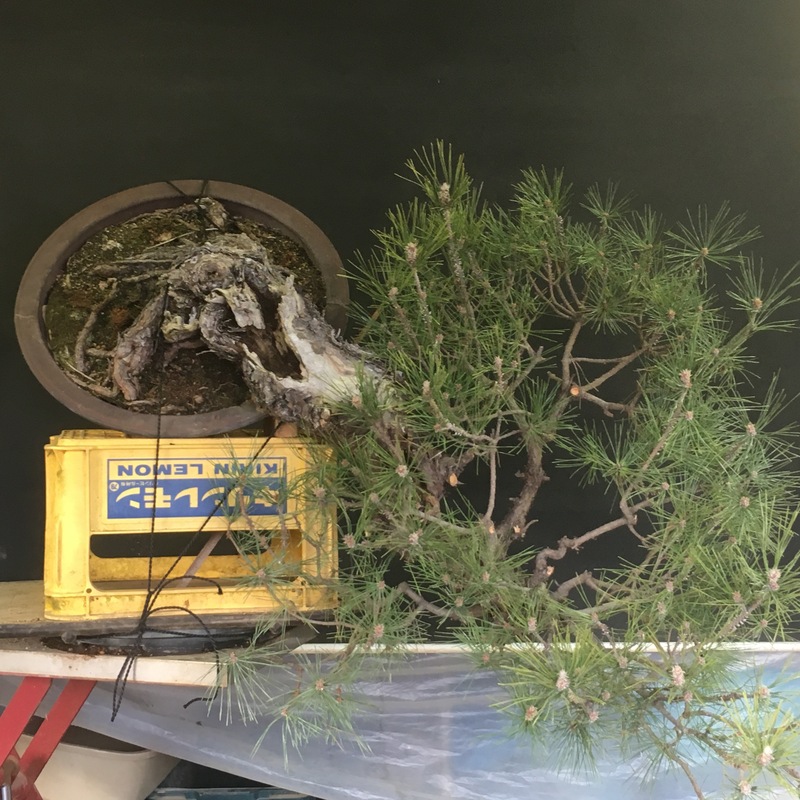 Recently a Chinese buyer bought about ten field grown black pines and when we where there loading them on to the truck Mr Tanaka asked us to bring back this tree for me to wire. Most of the tree’s their are nothing to write home about but, there are a few gem’s amongst it all. This tree is one that me and Juan had eyed up a long time ago because we knew that it had some potential to make a nice tree one day. It’s an old collected tree but, still very raw and reminded a little of the collected material back in Europe. 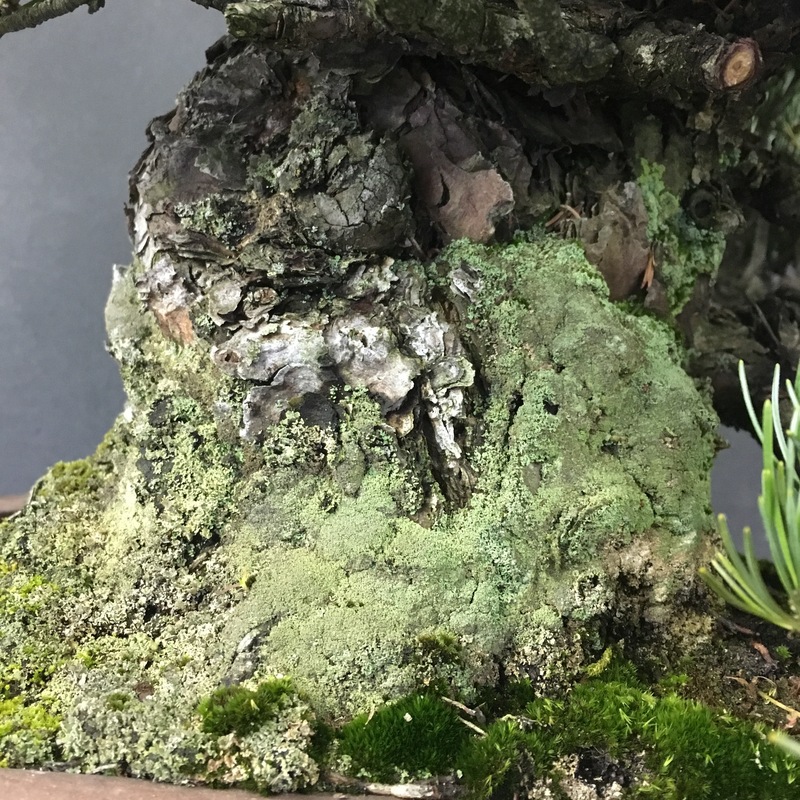 The main feature of the tree is the old shari on the trunk and this is what I wanted to show in styling. 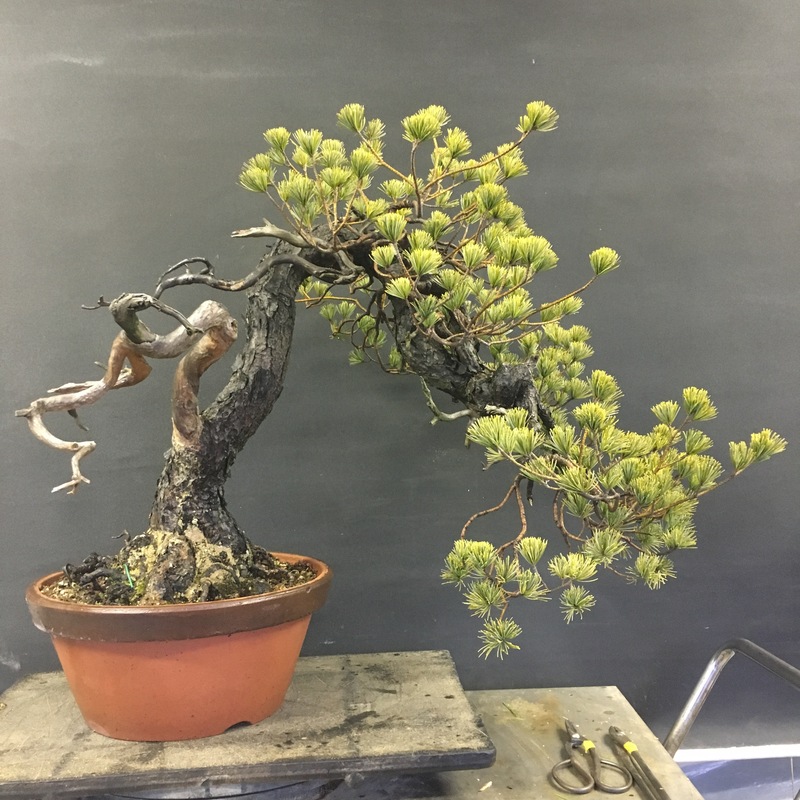 To start off I pulled needles and cleaned the inside of the sabamiki to see what branches & structure I have to use. 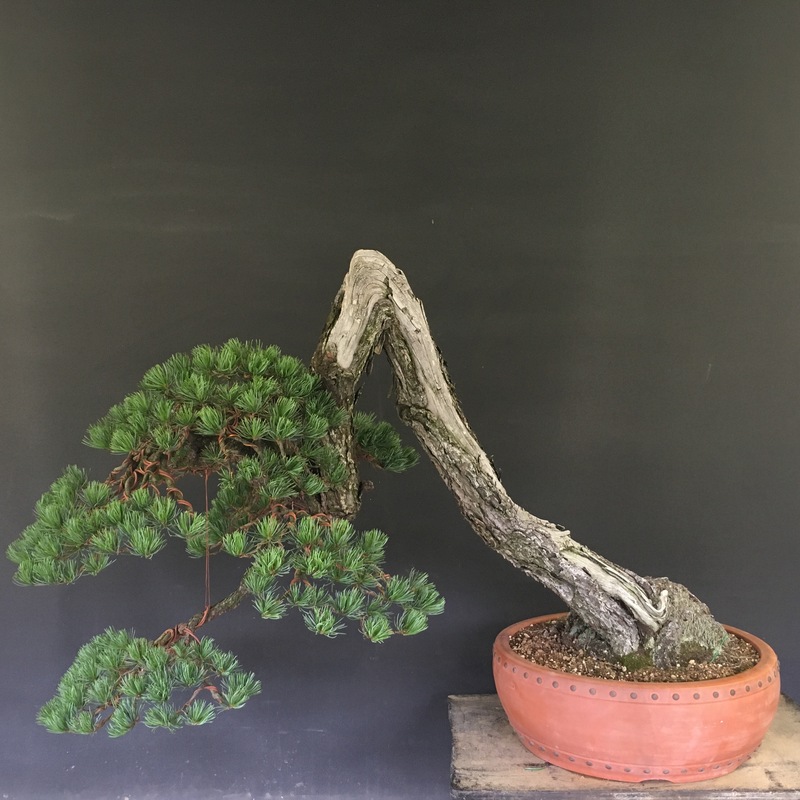 I removed a few ‘definate don’t need branches’ and looked at both sides. Either of them could be made both having plus and negative points. In the end though I went with my initial gut choice and what I believed would make the best tree in the future. Somewhere around this and having made the decision I gave Martín the all clear to remove a big branch going up. 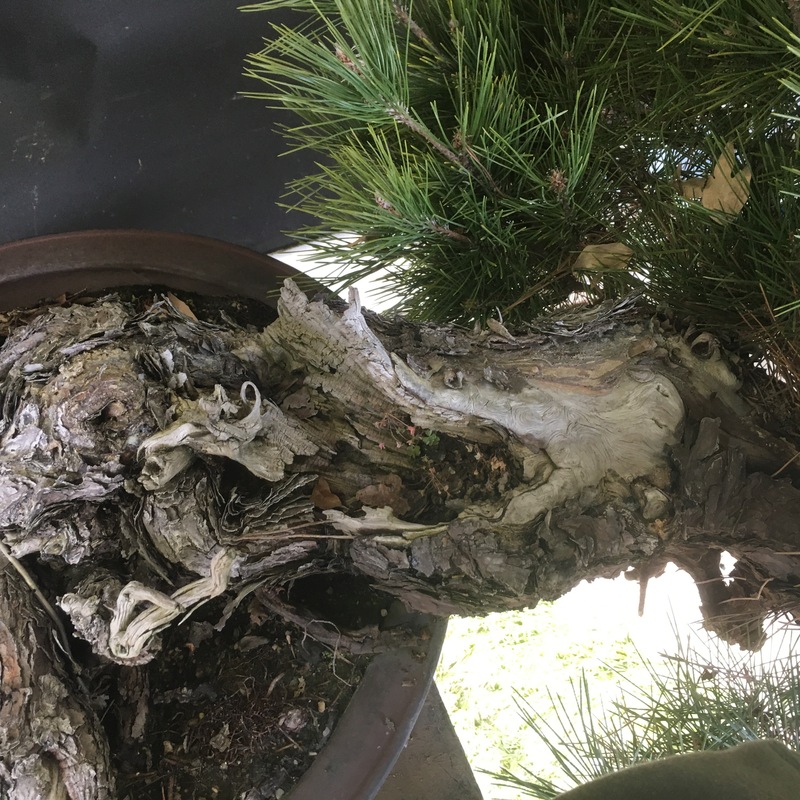 If I had chosen the opposite side as a front then this would have been the main branch, which was one of the main plus sides of using the other side, it being thicker and older branch. Using this side though, it was useless and had to go. 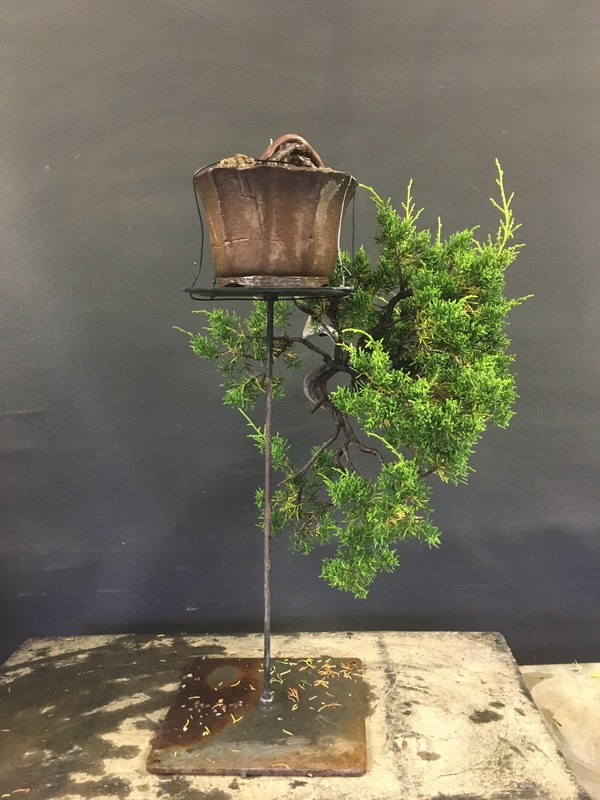 I then set about wiring the branches into place. 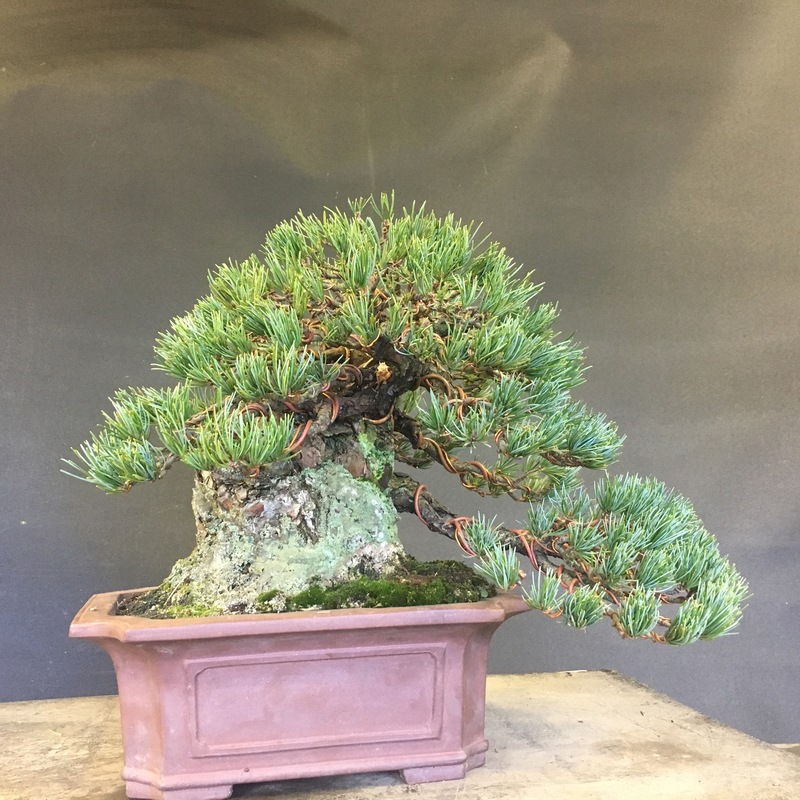 It wasn’t the easiest of styling’s, with young branches black pine can be very brittle but, they are strong and can handle a few small breaks. Finally with an up-potting here was the initial styling result. 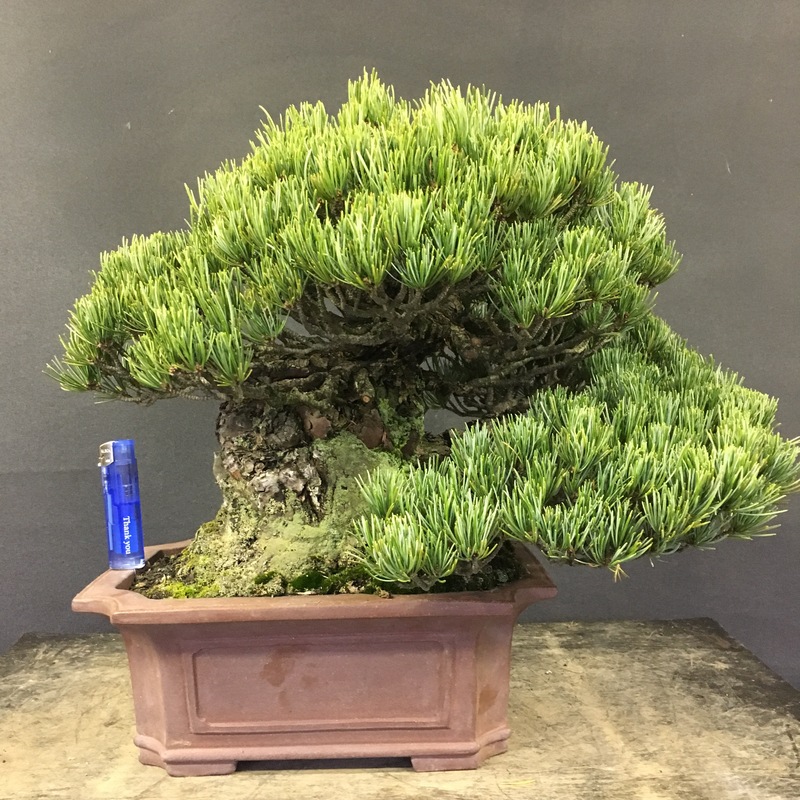 It’s still very raw and has a very long was to go but, I hope it’s a step in the right direction and on its way to being a bonsai one day. 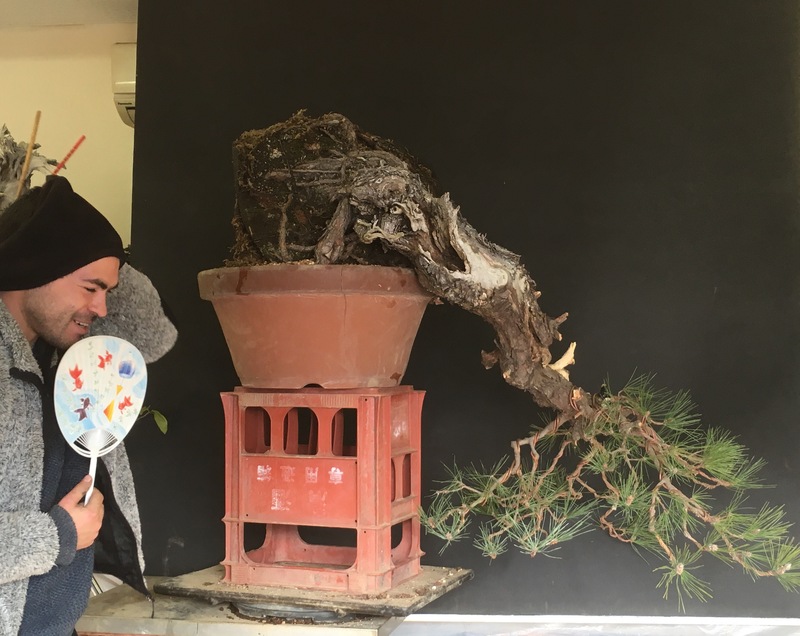 As I was taking the final picture a happy geisha came to view the tree to my surprise, just like you see in pictures of exhibitions in Japan! 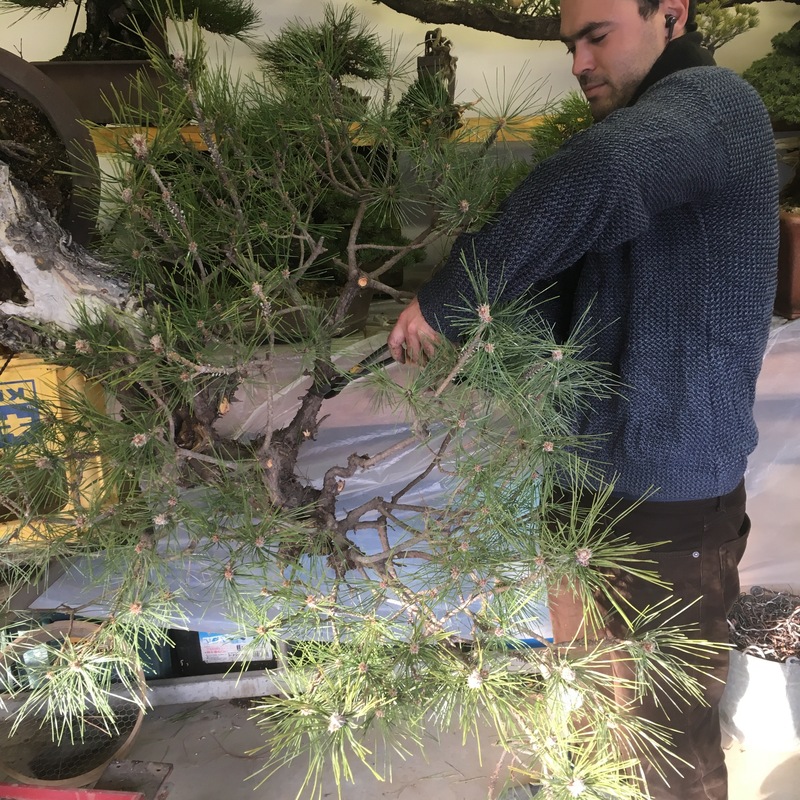 Back along Mr Tanaka came back with a new kifu sized white pine. 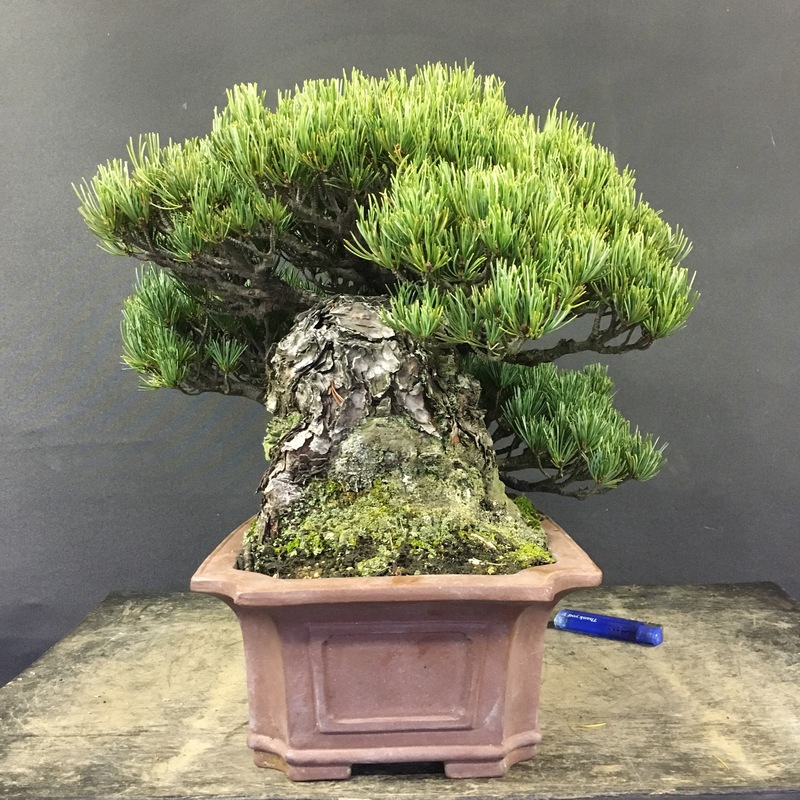 The tree is setsu-goyo/grafted on to black pine base which many of us are familiar with being as many are exported around the world. Favored for their strength and size. This one however is very old, older than many you see and sets it apart some what. 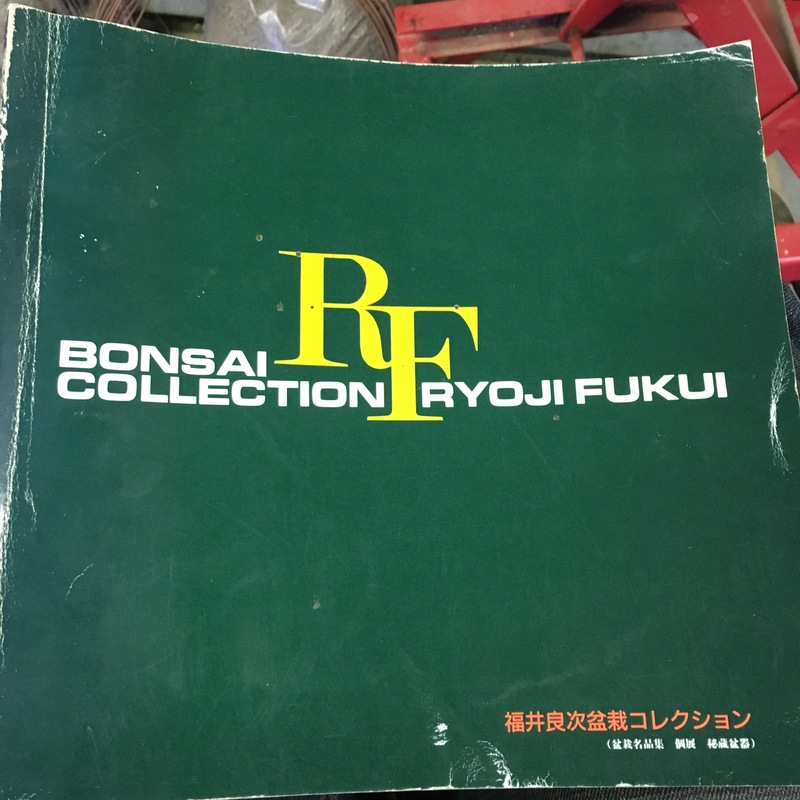 This tree also belonged to a famous collecter and customer who has since passed, Mr Ryoji Fukui. 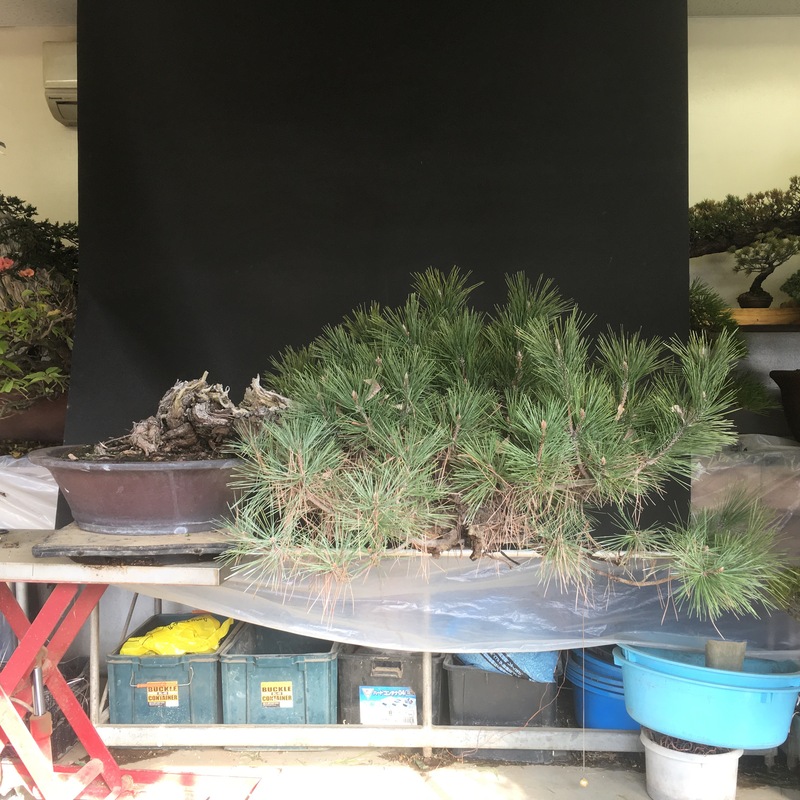 A customer of shokuji-en(Ishi-San), formally residing in Nagoya and now Inazawa, it was the most famous nursery in Nagoya. 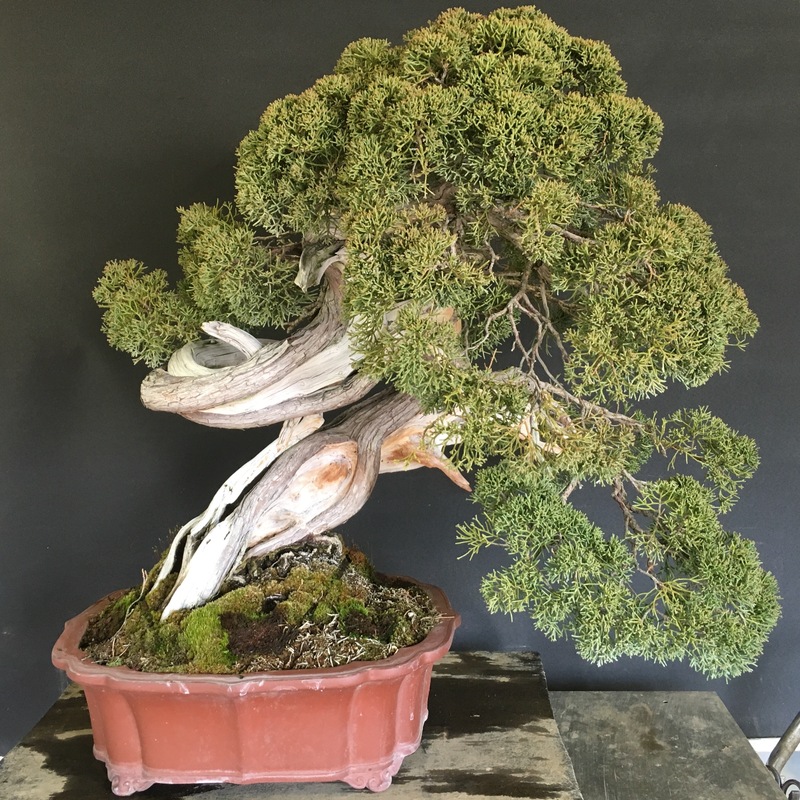 Shokuji-en is famous for shohin bonsai and Fukui-San was a shohin collector but, also had some very nice big tree’s. There is a published book of Fukui-San’s tree’s but, this tree does not feature in it. The book contains many we’ll known tree’s including Kokufu winner’s. 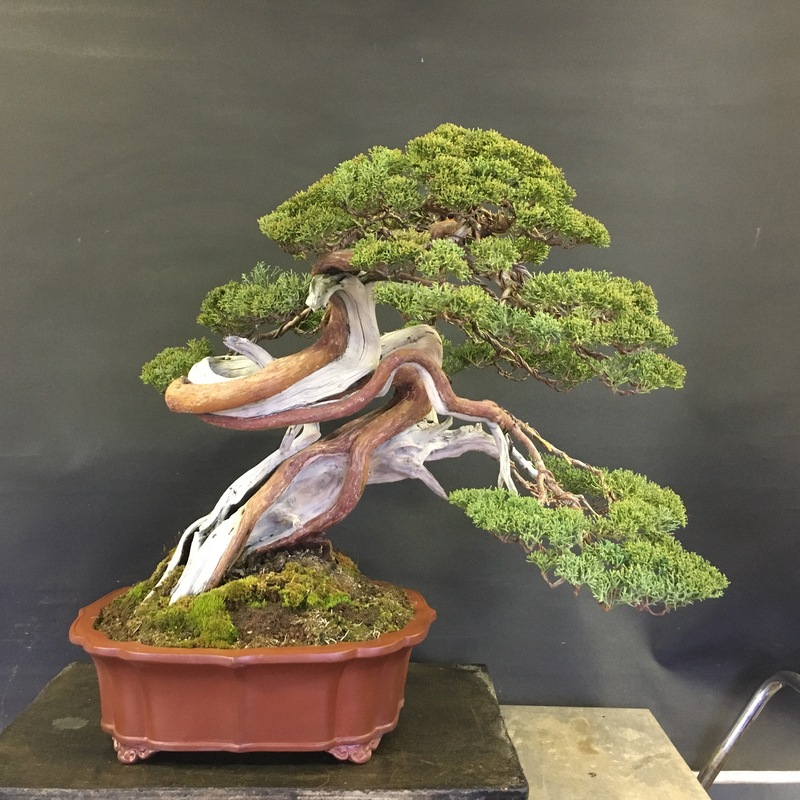 I set about working the tree according to Mr Tanaka’s instructions with a slight front change. 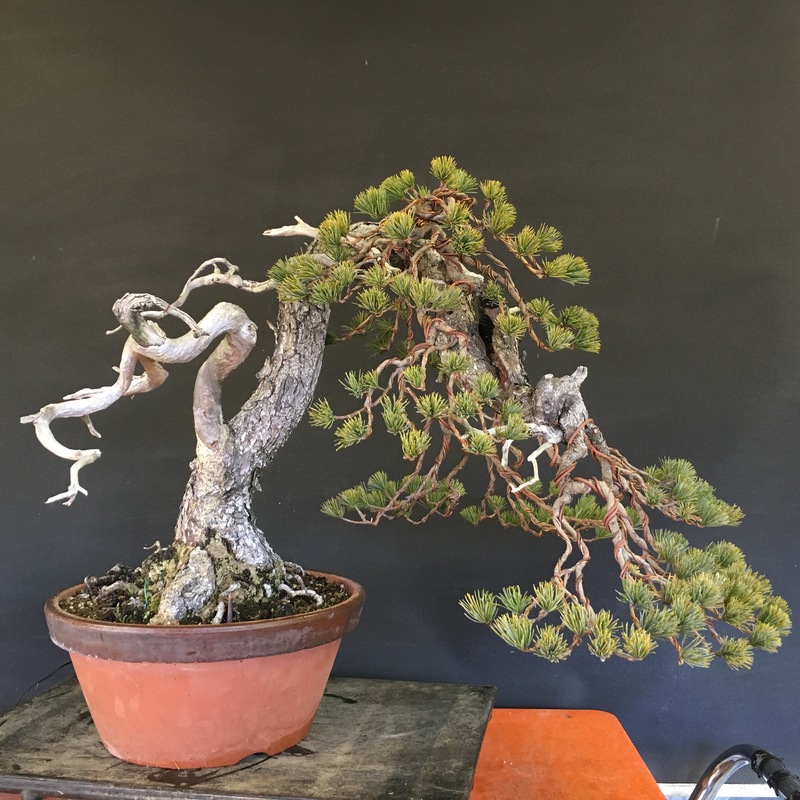 I had remove a branch at the front to show the trunk. 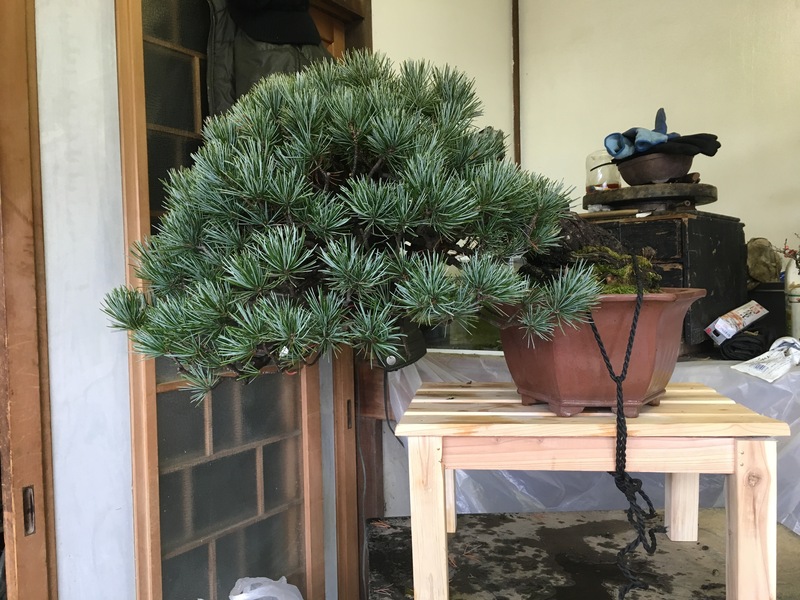 It had been some time since the tree had been worked, was leggy and really needed a structure set. 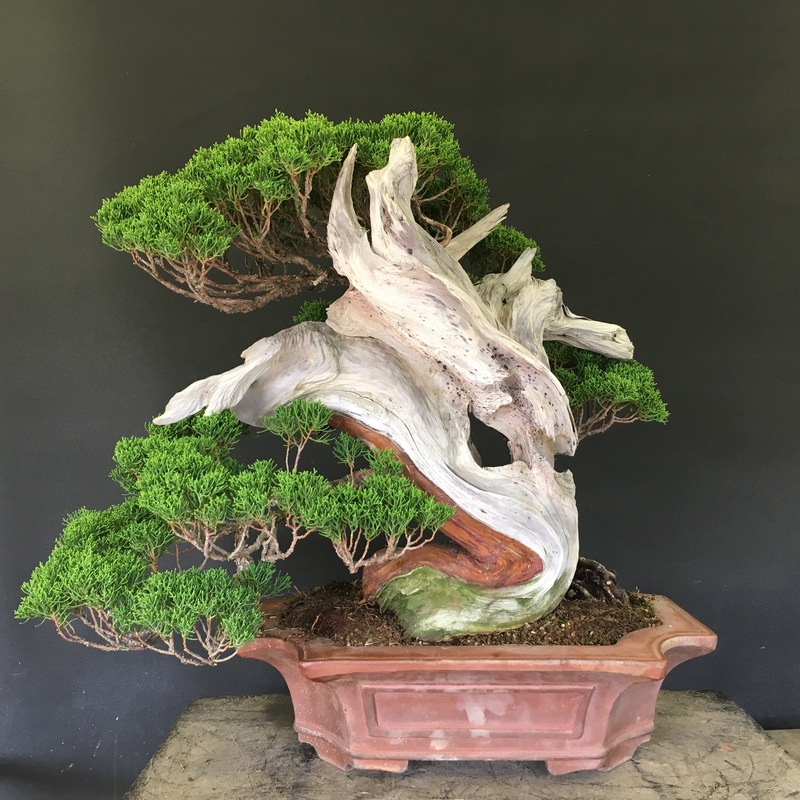 The tree also could do with a slight tilting to the right and in the future a more suitable pot change to show the real power of the tree. 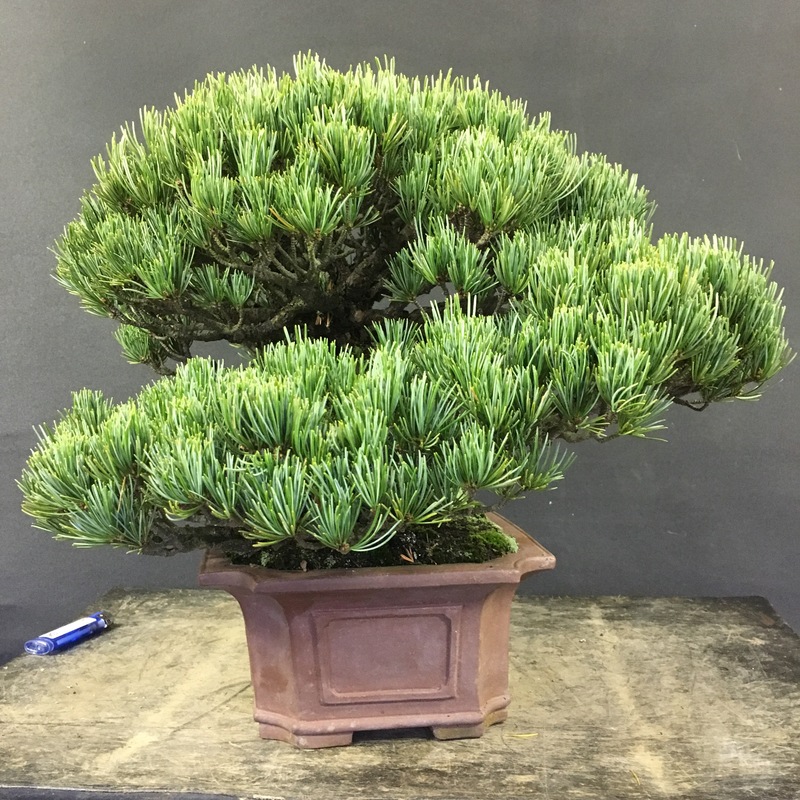 I look forward to seeing the pot selection Mr Tananka chooses and how much it will change feel of the tree in the near future. 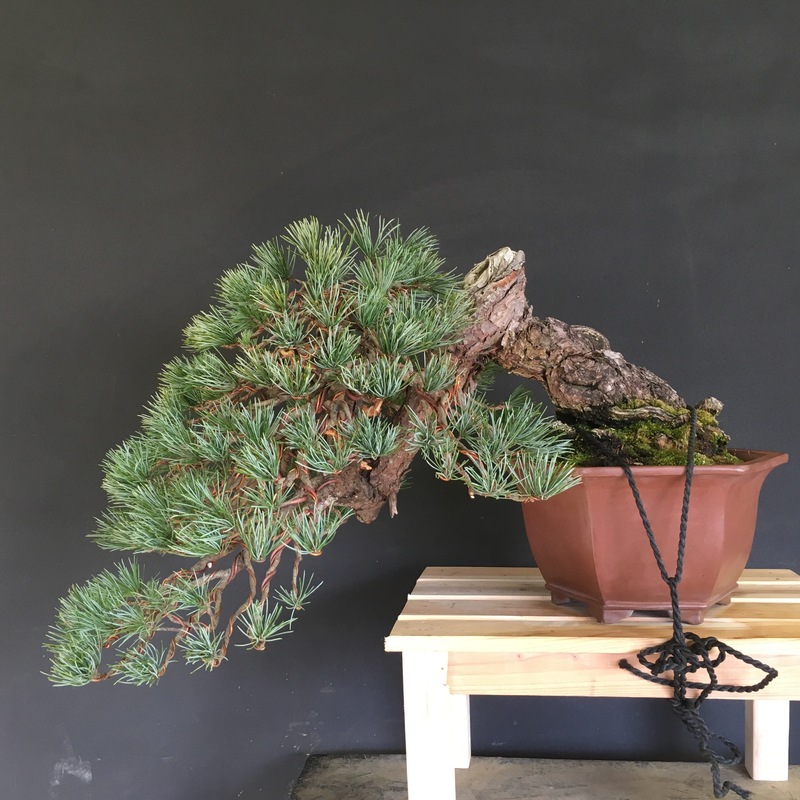 ﻿This white pine came to Aichi-en about two years ago, it has since been re-potted to change the angle a little and left to get healthy. 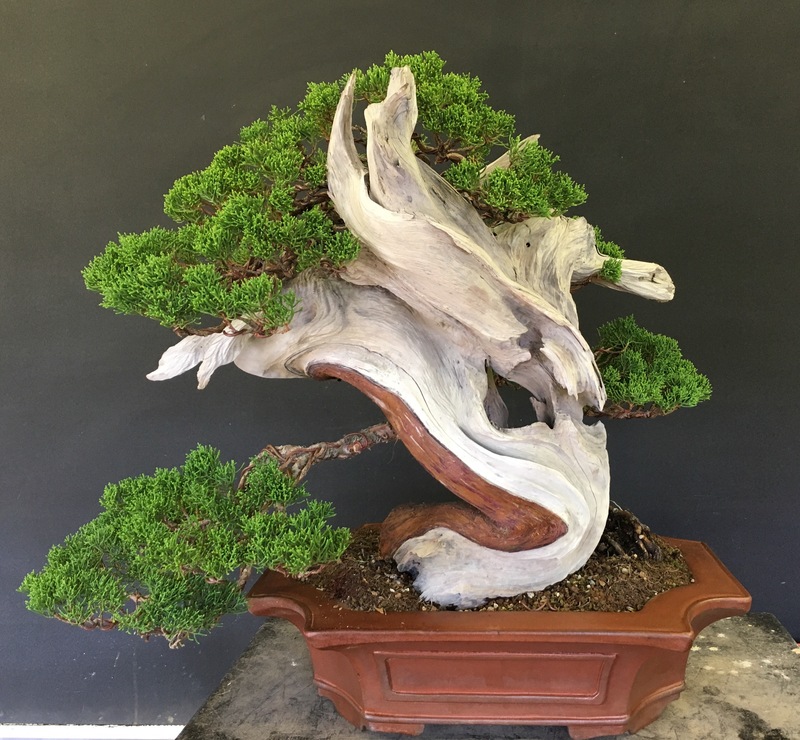 Mr Tanaka got for a good price and knew with a little work it would make a nice tree. It’s old and has some cool shari including some interesting ita-shari at the top. 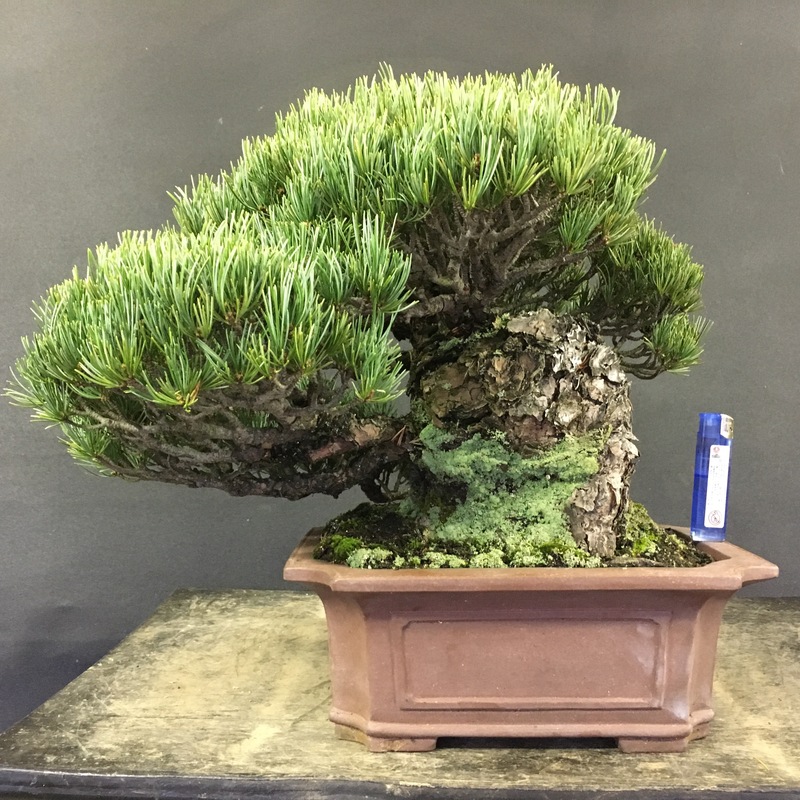 This is quite unusual with white pines and more commonly found in Shimpaku/Chinese junipers. 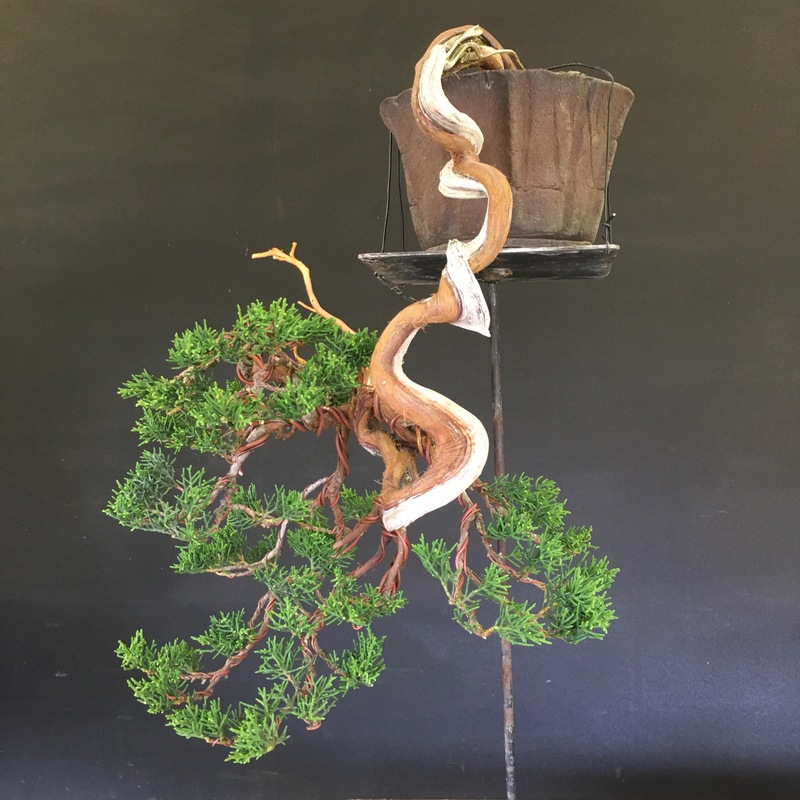 As I set about wiring it, I tried to consider the tree and its style. Being slanting with a slight bunjin feeling, I wanted to make the pads powerful enough to fit in with the chunky trunk but, not so heavy that it lost its mountain, literati feeling. I kept the main branch as one pad and tried to break the tree up more further up. For me the tree at the moment looks too clean for its style. It should look more natural more bunjin style foliage pads but, for now this was development work and setting the structure. Give the tree one or two years growth the pads will naturally soften up. To Kokufu or not to Kokufu??? 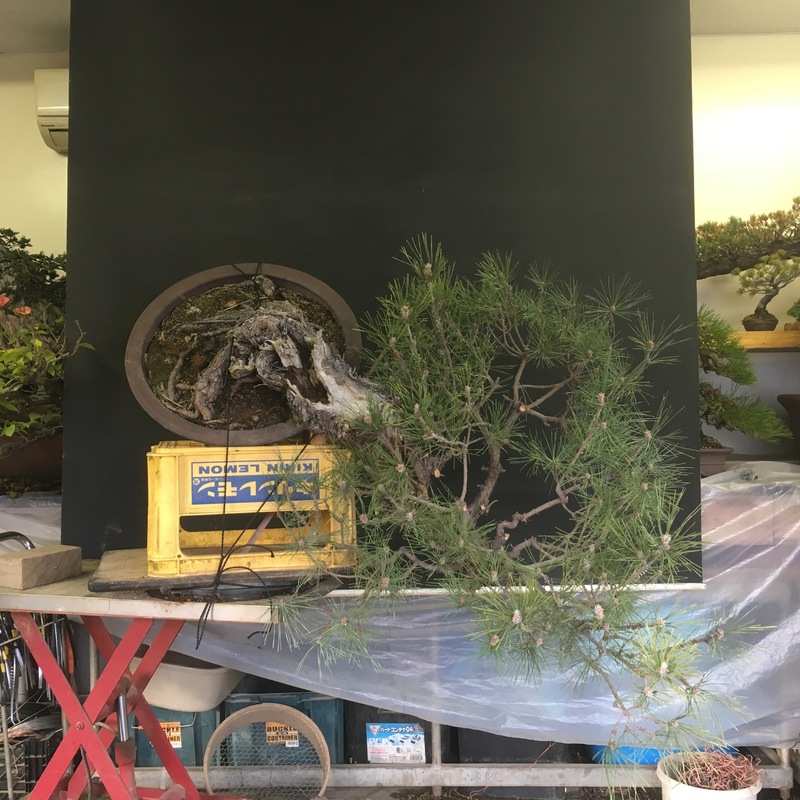 One day before Mr Tanaka was set to go to Kokufu he asked me to style this tree for the sales area. At the time it was just before we watered, it was close to lunch and I need to leave early that day (about 3:00) for personal reasons. Mr Tanaka and the guy’s were heading off to a customer’s for work after lunch. 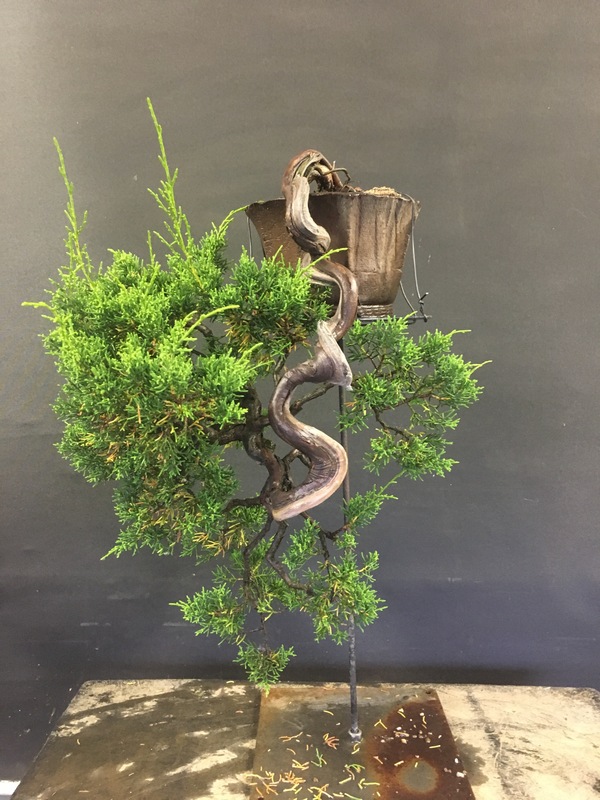 The tree had been bought previously bought by Mr Tanaka on-line. It is old, good leaf and many things going for it. The only problem with the tree from an earlier inspection is its bad branch structure. Knowing this and with my time limit I knew my work was cut out for me (apprentice pressure). So I set about wiring, cleaning the tree and pulling old needles as I went. Quickly we got called for lunch but, I ate fast and I went back to work straight after (not really any time for a lunch break). I didn’t have so much time to pontificate about which branches to cut or keep but, I tried to keep to Aichi-en style and improve structure best I could with still trying to make the tree look nice. I thought that it didn’t turn out too bad but, Mr Tanaka decided not too take it. Not sure if this was because he felt it wasn’t good enough or just decided to keep it.